Cotuit Federated Church nurtures the arts and artists in countless ways, guided by the model of its Equipping Team, whose mission it is to support members (and the pastor!) in channeling the gifts they feel called to use. The Cotuit Federated Church choir members believe greatly in their ministry of sharing the stories of Jesus. The choir rehearses on Sunday mornings and sings a wide variety of music from cantatas to broadway. There are frequent opportunities for soloists and small groups to sing during worship. The choir even sings their favorites and invites everyone to sing along during CraftFest. Anyone is welcome to join the choir, as voice and music instruction occur during rehearsal. Our members must only have a song in their heart and a willingness to share their gifts with the congregation. 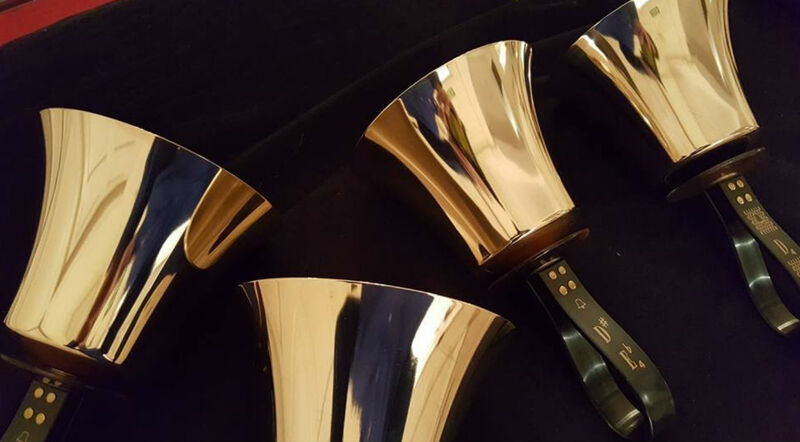 The handbell choir adds contemplative and joyful music to worship. This group meets weekly and performs monthly from September through May. Anyone is welcome to join this group as instruction in handbell technique and music theory occurs during rehearsal. We are blessed to have three octaves of Schulmerich Handbells and four octaves of Malmark Handchimes to ring during services. Our church love to share their musical gifts with the congregation and enjoy challenging themselves with new genres of music. Each year during Craft Fest we are delighted to turn the church steps into a main stage for diverse local musicians, as crafters and shoppers are entertained for two days by over a dozen different singles and groups, including of course Cotuit Federated Church’s hilarious tambourine band! Our annual outdoor crafts festival attracts thousands of visitors to the idyllic Cape village, located in the Town of Barnstable, on the hilly and wooded shores of Cotuit Bay and Poponessett Bay near Nantucket Sound. Although handmade crafts are the main attraction, a large tent of selected painted works by local artists is an anticipated highlight of the show. And while many come in search of a visual feast, others come for the food! Volunteers from the Cotuit Federated Church traditionally offer visitors an oversized lobster roll and creamy clam chowder prepared in the church’s adjacent kitchen. Our annual small works show and sale coincides with the annual village-wide Christmas in Cotuit celebration. This show features original artwork by local artists, framed and moderately priced for holiday giving! Christmas in Cotuit takes place around the village on the first Saturday in December. The Wednesday Artists of the Cotuit Federated Church welcome new, aspiring, or experienced artists to join in the fun of painting on Wednesdays at 9:30 AM to 12:00 Noon. Everyone is very busy painting their own selections. Beginning, Intermediate and Advanced painters are welcome. Painting starts in September and continues until the end of June. Participants need to provide protective covers for the tables and a canvas or plastic for the floor, as well as all their own art supplies including easels, etc. The church provides tables and chairs. Bruce Hall is a very comfortable room with a lot of space for each painter. The group celebrates some holidays and special birthdays with an occasional lunch out or party in. The cost is $5.00 for each Wednesday attended. The funds are collected by semester and given to the church along with a small donation to show appreciation for the use of the hall. If you are an experienced or an aspiring artist, please consider joining the Wednesday Artists. Questions? Phone the church office on a Wednesday and speak with the Administrative Assistant or request one of the artists. Cape Harmony is Cape Cod’s premiere a cappella group, comprised of ten talented young women from all over the nation who come to Cape Cod during the summer to make music for its residents and visitors. Founded in 2006, Cape Harmony has become a dynamic group with a unique sound and superb quality. Cape Harmony performs Wednesday nights at Cotuit Federated Church from June to August. Tickets are available at the door. Performance times and dates are found on their website:​ https://www.capeharmony.org.